Charlie was a three-year-old Labrador retriever presenting to his veterinarian with hemorrhagic diarrhea for at least one week, lethargy, uveitis, and acute onset of blindness and incoordination . Diagnostic testing included free catch urinalysis. The patient had a mild inflammatory and superimposed stress leukogram with a mild non-regenerative anemia. The chemistries were not available. Urine collected via free catch was submitted to the lab. The urinalysis revealed rare uroepithelial cells, 0-3 WBC’s/HPF and low numbers of atypical oval shaped structures. What is Your Interpretation of the Urine? 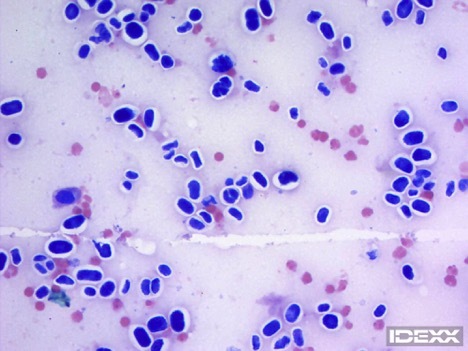 The sediment slide was stained with Wright’s stain (figures 1 – 3) and was directed to a clinical pathologist for review. What is your interpretation? Figure 1. Urine sediment stained with Wright’s stain. Viewed with 20x objective, magnification 200. Figure 2. Urine sediment stained with Wright’s stain. Viewed with 50x objective, magnification 500. Figure 3. Urine sediment stained with Wright’s stain. Viewed with 100x objective, magnification 1000. Here is the pathologist’s review of the urine. 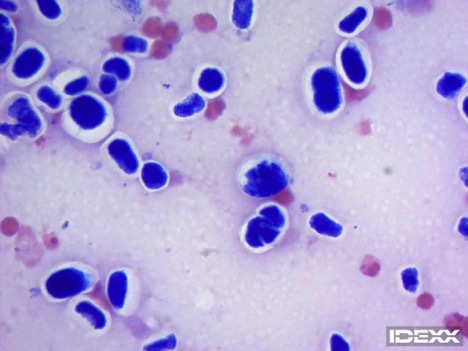 Urine sediment: The slide reveals low numbers of uniform but degenerating squamous epithelial cells, as well as large numbers of oval shaped, structures consistent with microorganisms. These were variable size ranging from 5-15 microns. The structures revealed a negative staining cell wall. 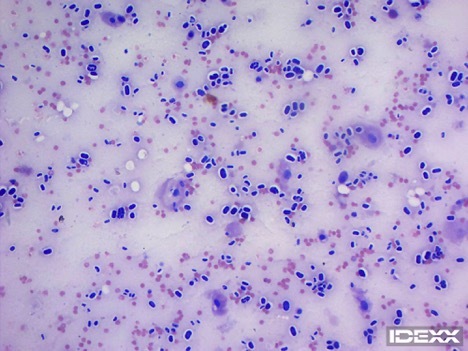 Some of the structures were basophilic and granular appearing while others were more uniformly darkly basophilic. Several of the structures contained multiple endospores. Prototheca is a ubiquitous type of algae most commonly seen in the warm, humid climates of the south and southeastern states in the U.S. Texas and Florida are the most common geographic areas but other states, including California, Ohio and South Carolina, have had canine cases reported. Unlike most algae, these organisms cannot obtain energy from photosynthesis; they require decaying organic matter for survival and is commonly recognized in sewerage, but also fresh water and salt water environments. The algae only rarely causes disease in people and animals. In veterinary medicine this disease is most commonly seen in dairy cattle and causes mastitis. Prototheca most commonly manifests in humans and felines (although very rare in felines) as cutaneous lesions likely resulting from inoculation of a wound. In dogs however, it can cause systemic disease which is usually refractory to treatment. In dogs, it is presumed to be acquired via ingestion from ponds or other water sources. Prototheca typically is associated with GI signs first, but often disseminates to the eyes/retinas, the central nervous system (CNS), and kidneys. Gastrointestinal signs are the most common presenting complaint with colitis and enteritis often resulting in hemorrhagic diarrhea. Approximately 50% of canine patients present with CNS signs. Ocular lesions are also very common and is usually bilateral manifesting with retinal detachment and uveitis. The organisms can be found in the urine of more than 50% of dogs with disseminated disease. Their presence in urine is due to dissemination to the kidneys. It can be seen in vitreous humor or retinal aspirates in patients with ocular disease. Organisms can also be seen in CSF samples with neurologic disease. When the organism is found in urine, it can be mistakenly identified as Candida organisms (though pathologists usually don’t have difficulty with this distinction) and it is important to be aware of the possible significance of these organisms in patients with GI, neurologic and/or ocular signs. The organism reproduces via endosporulation, as can be seen in the photos. Although this condition can be diagnosed via cytology alone, this Patient had a sample submitted for PCR indicating it was Prototheca zopfii. Charlie was euthanized soon after diagnosis due to rapidly deteriorating quality of life. Diagnostic Challenge: Why is Angel Anemic? Diagnostic Challenge: Why is “Jensen” Sick? Is Your Pet in Pain? Look for these signs.